Try these delicious recipes featuring canned peaches year round. For a larger version of the infographic, please click on this image. This simply sweet sauce is a great pairing for any meal. Use it to top waffles or oatmeal for a healthy treat. You can also put your own twist on savory dishes by pouring the sauce over grilled chicken, pork or seafood. Looking to spruce up your classic grilled cheese? Look no further! The sweetness of peaches in this familiar favorite pairs perfectly and makes for a fun way to add more fruit to your day. Cool down with this peach cooler! This sweet and tangy peach beverage makes for a refreshing snack that will quench your thirst on a hot summer day! This breakfast will help wake you up and get you out of bed – warm fruit topped with crunchy granola and the citrus-y flavor of orange. Peaches make this chicken salad sandwich sweet and it pairs nicely with crisp celery, apples and red onion. Perfect for a picnic or packed lunch! The other “5 Ways” infographics, including Berries 5 Ways, Yogurt 5 Ways, Turkey 5 Ways and more, are available at www.choosemyplate.gov/5ways. For more information about foods that grow in your state, visit our MyPlateMyState page! Check out www.whatscooking.fns.usda.gov for more healthy recipes and learn more about the Fruit Group at choosemyplate.gov. Follow @MyPlate on Facebook, Twitter, and Pinterest, and sign up for MyPlate email updates at choosemyplate.gov/govdelivery. 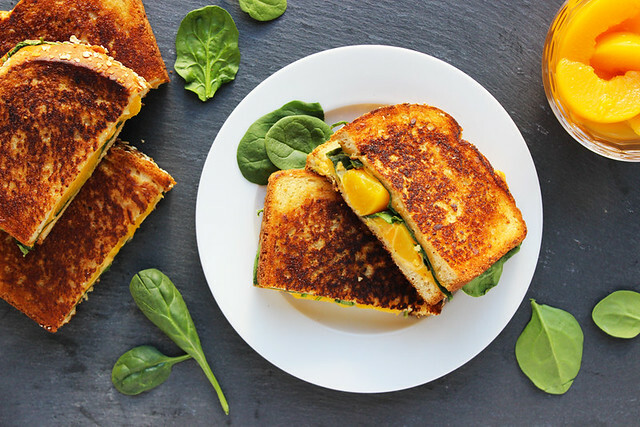 A delicious twist on a classic recipe—Grilled cheese with peaches. I LOVE the peaches infographic. But I HATE that it is nearly impossible to download and make copies of for distribution to my clients!!! It's too long for standard letter size paper. And if you shrink it down to fit - the print and graphics become much too skimpy to see. Is there any way when you develop these that you can also provide a one-standard page-size PDF along with it that's easy to download and copy? That sure would help me. In this form - it's practically useless for my needs. @Sue Tortello, RD - Thank you for your feedback! We are happy to hear you love the infographic. Please visit our 5-ways page on the ChooseMyPlate site here: www.choosemyplate.gov/5-ways-series. You can download the infographic as either a PDF or JPG and it will fit on a 8.5 x 11 sheet of paper. Looks Yummy. I've shared with family and friends. @Marilyn Viehl - Thank you for reaching out! Please visit the recipe on What’s Cooking for the Rise and Shine Cobbler. The recipe is for 4 servings and the ingredients, portions and directions are all listed on the recipe page. I'D LIKE TO PRINT THIS, AND SHARE IT WITH ALL THE PARTICIPANTS I COME IN CONTACT WITH AT THE SNAP-ED PROGRAMS I TEACH. THIS IS WONDERFUL.